If you are looking for a tablesetting that is casual and contemporary, consider using single flowers in individual vases as opposed to the traditional floral centerpiece. This is an easy-to-do tablescape for anyone, even those who are not knacky with floral design. If you can fill a vase with water and place a flower in it, you can do this tablescape! White milk glass has seen a resurgence in popularity in recent years and remains, at time of writing, quite trendy. It’s clean, unobtrusive, and nondistracting on the table. One of the things I like best about milk glass is that it’s opaque meaning the flower stems are not visible. The other great thing about milk glass is that it’s inexpensive and often available at thrift shops for very little money. In addition, it’s easy to mix and match milk glass shapes, sizes, and textures and still have the tablescape work and look aesthetically pleasing. In this setting, I have used a mixture of heights and designs of milk glass bud vases because this makes for a more interesting tablescape design. Always opt for an odd number of vases versus even numbers as this is more pleasing to the eye. The vases can be interspersed along the center of the table as shown in the photo above. Or, as demonstrated in the following photo, they can be grouped into clusters of two and three and strategically placed in the center of the table. The vases can also all be clustered close together in the center for a real concentrated burst of color making this a very versatile style of tablescape. With this type of tablescape, it’s easy to adjust the number of vases according to the size of the table. For example, if the table seats 12 or 16, add more clusters of vases here and there down the length of the table. I have chosen tulips for this design because it’s springtime and I love tulips! However, any single bloom flowers will work – roses, Gerbers, daisies, carnations, etc. Two blooms can be added in one or two of the vases but try to keep the whole setting informal, simplistic, and not too contrived or equally balanced. It’s also attractive if the heights of the tulips are varied, too. To add more interest and some visual weight to the look, I have added a small sprig of salal to a couple of the vases, but not them all. Adding salal to every vase is starting to cross over into the zone of trying to have every vase identical. Also, adding some wispy bear grass adds texture and interest so long as not too much is added. The tulips were greenhouse-grown here on Prince Edward Island at Vanco Farms in Mount Albion. Click here to read the story I wrote a few years ago on their tulip production. For unity, I recommend going with all one color of flower for all the vases as it’s less distracting to the eye and looks more coordinated. In modern, contemporary and casual tablesettings, it’s very common to forego tablecloths and, as shown in this setting, to let the wood of the table be visible. It gives a lighter, more airy, and less fussy look to the table than if a full tablecloth was used. 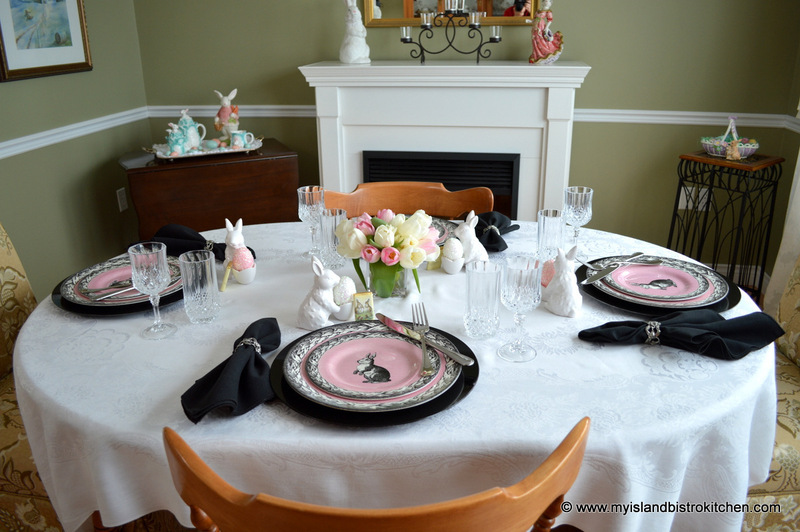 I have opted to use basic white placemats simply to “ground” each individual placesetting. I’m a big fan of high-quality plain white napkins because they go with almost anything. In this setting, I have chosen the pure elegance napkin fold and placed it in the center of each plate. Because the top plate in the setting is patterned, the plain white napkin keeps the setting more simplistic and less distracting than if a patterned napkin was used. This napkin fold dresses up the setting, giving it a wee bit of height. Placing the napkin on the plate keeps each place setting neat and tidy. I advocate for the use of white dinnerware because it shows food to its best. However, I also like to set a pretty table with my formal Royal Albert “Lavender Rose” china. But, sometimes, the china can be a bit formal for the occasion. In these situations, I pair pieces of my china with my white porcelain everyday dinnerware as I have done here. Pale pink charger plates have been used to frame each setting topped with the white dinner plate and then the Lavender Rose salad plate on top. This salad plate gives color to the setting and the colors match the tulips. By mixing the plain white with the patterned china, it makes for a more interesting setting without becoming overly formal. The wine glasses I have selected for this setting are quite tall. They have a simple sleek shape, almost reminiscent of the tulip shape. These work well with a contemporary/modern tablesetting. Because I have gone with a more casual contemporary look for this setting, I have used a simple design of flatware. I have not included the dessert fork and spoon because those can be placed on the table along with the dessert course. Foregoing them in the initial setting helps to keep the look of the table clean and simple, particularly when there are five vases as opposed to one single floral centerpiece. 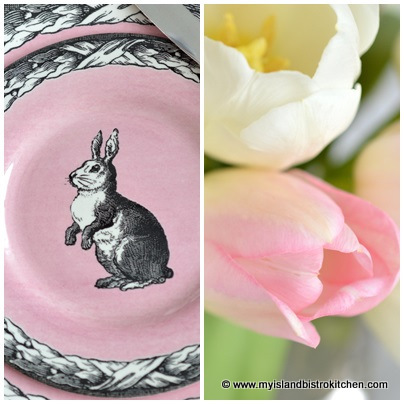 I hope you have enjoyed viewing this springtime tablesetting! It’s great to see bright cheery colors after a long winter! 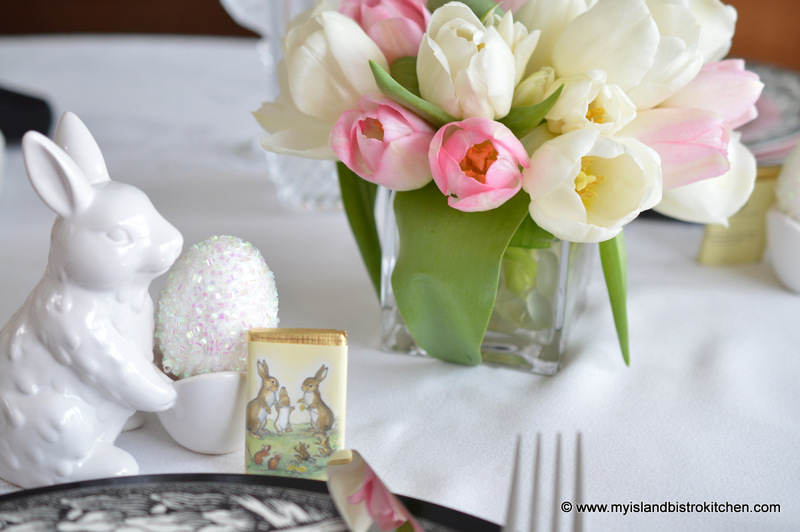 Today, I am sharing a slightly different tablesetting for the Easter season. 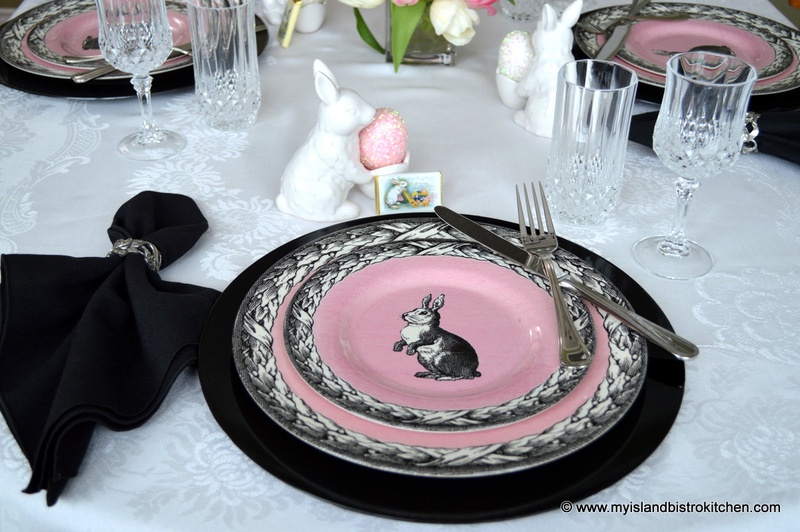 The theme is pink and black and Peter Cottontail tip toes through the tulips! 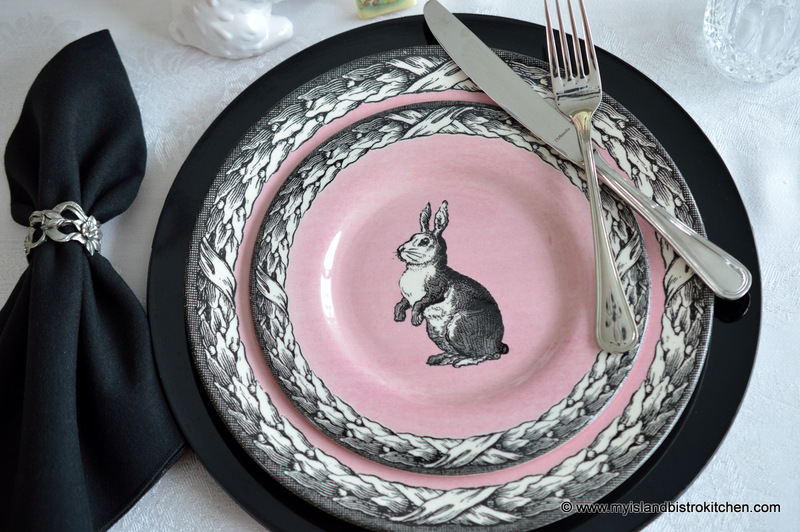 Let’s start with the dinnerware. 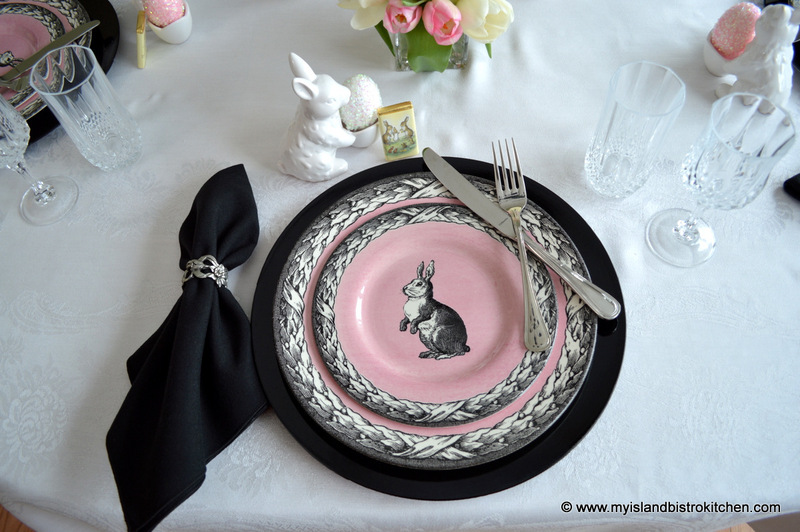 The pink background of each plate with a black and white bunny and border make this a dramatic set of Easter holiday dinnerware. I started with my traditional white linen tablecloth as a blank canvas. I have opted to frame each place setting with a black charger plate which really makes the plate design pop, particularly against the white background. 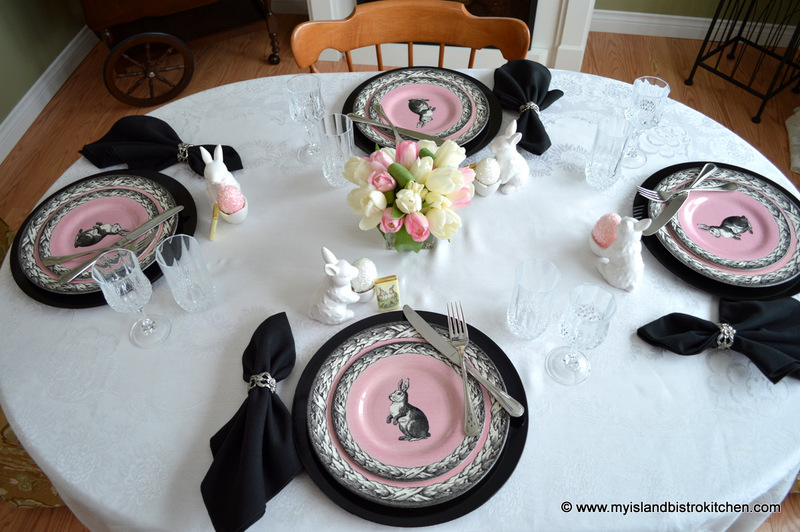 Matching black napkins complement each place setting. 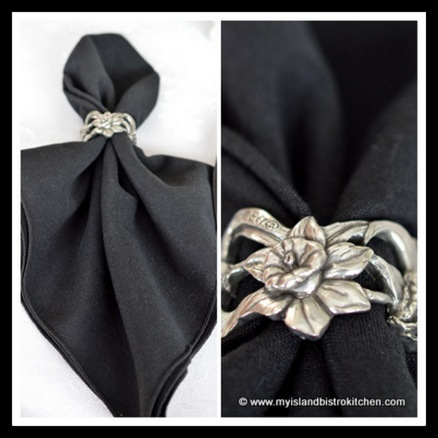 The pewter napkin rings feature a springtime daffodil design. 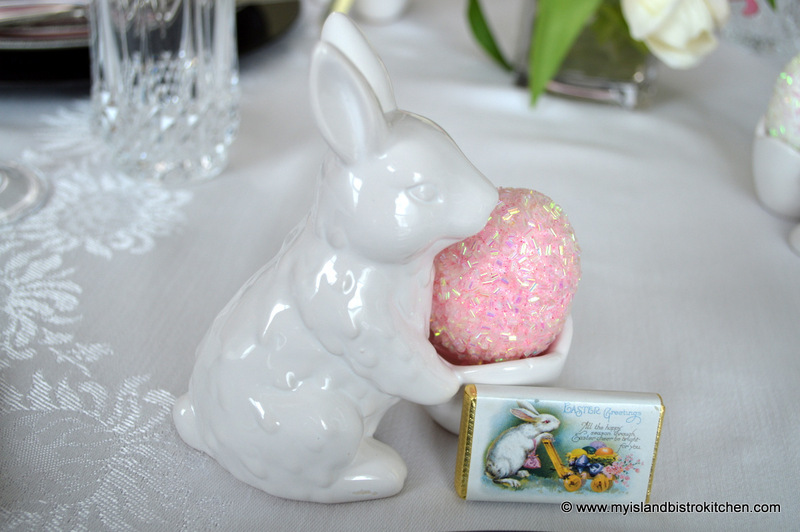 A little Easter bunny egg cup is set at each place setting along with an Easter-themed chocolate. And, when all the elements come together, this is what each place setting looks like. Here is an overhead view of the placesetting which I would class as contemporary-casual. 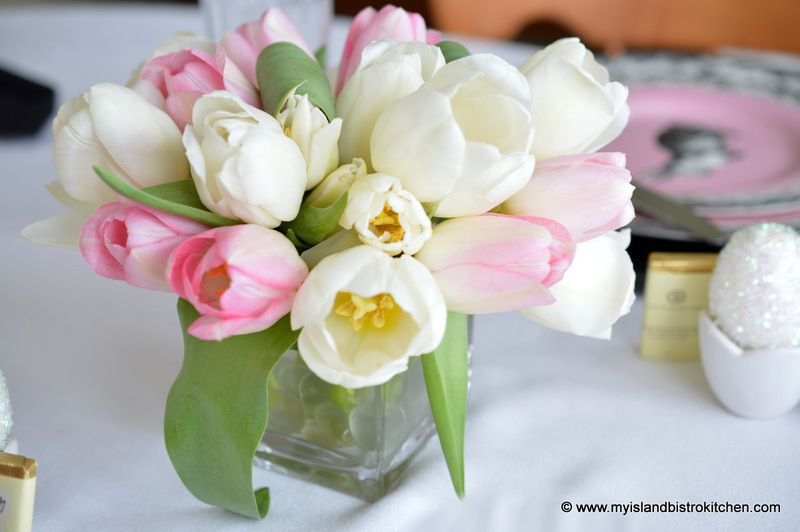 The beautiful pink and white tulips on today’s table came from Vanco Farms in Mount Albion, PEI. Click here to read my story on this Island farm that grows, sells, and ships tulips from their large greenhouses. I feel very fortunate to be able to go direct to the Vanco greenhouse to buy their tulips and I am rarely without these beautiful flowers in my house throughout the winter and spring. 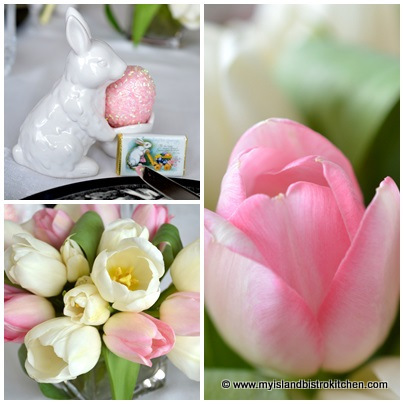 The tulips from Vanco Farms come in a vast array of colors and I can match up any color scheme of tablesetting with them. 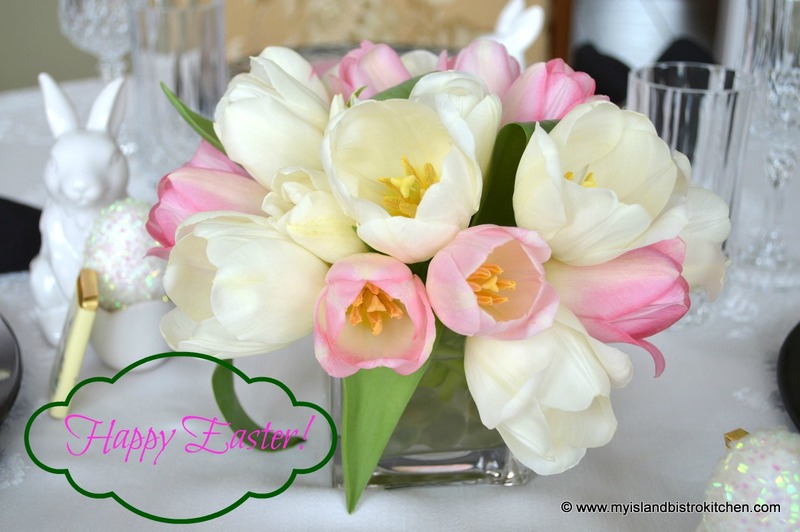 The pink ones I have chosen for today’s tablesetting are very delicate and procelain-like and they pop against their neighbouring white tulips. A dressy yet simplistic and uncluttered tablesetting.